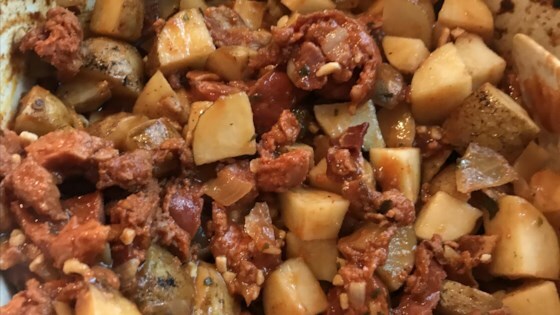 "This hearty slow cooker dish concocted by my grandmother consists of linguica, potatoes, zucchini, onions, and bacon. You can add other vegetables like mushrooms and green beans, but I prefer the original recipe." In a skillet over medium-high heat, cook the bacon until crisp and evenly brown. Drain, reserving juices, and break into bite-size pieces. Place the pieces in a slow cooker. Cook the onion and garlic in the reserved bacon juices over medium heat until tender. Drain, and place in the slow cooker. Quickly brown the linguica sausage in the skillet over medium-high heat, and place in the slow cooker. Add the potatoes, zucchini, tomato sauce, and red wine to the slow cooker, and season with parsley, basil, salt, and pepper. Stir to evenly distribute ingredients. Cover, and cook 2 1/2 hours on High, stirring occasionally, until the potatoes are tender. Super dish! My potatoes did not cook as quickly as planned. Might be my slow cooker. Start early, because this gets better with age. Seasonings are perfect! This dish is OK but nothing to write home about. To add more flavor, I think it needs more garlic, and add generous tabasco. I was looking for a recipe to use for my son's venison kielbasa. This one worked great! My entire family loved it! I will definitely make it again.